MiniTest is a fast and lightweight testing library. Here you will learn how to use it in a Rails app for model, helper, and integration testing. The Turn gem is also demonstrated for prettier test output. Ruby developers have a number of testing libraries to choose from. RSpec, Shoulda and Test::Unit are the most popular but in this episode we’re going to look at minitest. Not only is this library fast and lightweight, it comes built-in with Ruby 1.9. Rails developers should pay special attention to it as it looks like it will be the default test environment in Rails 4.0. That day is a long way off yet, so let’s take a look at what’s involved in using minitest with Rails 3.2. By the way, this episode isn’t meant to be a complete guide to testing. If you’re new to testing you should first take a look at episode 275 which covers testing from scratch. The first thing we’ll do is generate a new Rails 3.2 application. We’ll pass in the -T option to tell it not to use Test::Unit. As we’ve told Rails to skip the tests there’ll be no /test directory in this app and in its config/application.rb file the test_unit railtie will be commented out. This means that the test-related Rake tasks will not be available. # rest of file omitted. This also means that generators won’t create any test files. We’ll generate a scaffold for a product to demonstrate this. As you can see the generator didn’t create any test-related files. We’ll be using this scaffold for our tests so now’s a good time to run rake db:migrate to create the products table. Now we have a blank slate for testing so let’s add minitest. To start we’ll add its gem to the test group in the gemfile and then run bundle to install it. 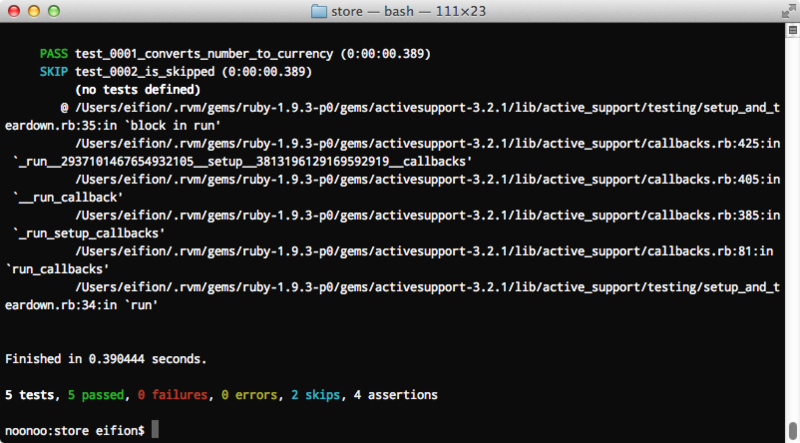 Minitest comes built-in to Ruby 1.9 but by using the gem we’re using the latest version and it’s easier to manage the version dependencies. Now its time to add our first test. Before we can do this, though, we need to get minitest set up. We’ll do this inside a new /test directory with a minitest_helper.rb file. The first two lines of code in here should look familiar if you’ve seen the standard generated test helper. The first line forces the test environment while the second loads up the Rails application. We also need to start minitest and that’s what the last line does. Now that we have minitest set up we’ll write our first test, which will be a model test. We’ll put this is a models directory, but you’re free to structure your tests in any way you want. There are a couple of different ways to create tests with minitest either in a Test::Unit style or in an RSpec style. We’ll use the Test::Unit style first. To write tests in this style we need to create a class that inherits from MiniTest::Unit::TestCase. All methods that start with test_ are considered test methods so we’ve called ours test_to_param. Our objective here is to override the model’s to_param method so that it includes the name as well as the product’s id so in the test we create a new Product and use assert_equal to test that calling to_param on a product with a name of “Hello World” returns the product’s id followed by “-hello-world”. We can run the test now and we’ll run it through the ruby command. We need to include the test directory so that it can find the minitest_helper file, so we pass in the -I option here. When we run this we see the error Could not find table 'products'. This happens because when we ran the database migration earlier it only created the table in the development database. To get the test database into the correct state we’ll need to run rake db:test:prepare. When this command has finished we can run our tests again. Finished tests in 0.027575s, 36.2647 tests/s, 36.2647 assertions/s. This time the test runs, but it fails as calling to_param on our product has returned 1 instead of 1-hello-world. This isn’t a surprise as we haven’t overridden to_param in the Product model so let’s do that now. When we run the test now it passes. Finished tests in 0.177981s, 5.6186 tests/s, 5.6186 assertions/s. It’s a pain to have to run that long ruby command every time we want to run our test so we’ll move it into a new Rake task. Here we use Rake::TestTask to create a new task. This task will also run the db:test:prepare task so that we don’t need to worry about running it manually when we create further migrations. The code for this task adds the test directory to the load paths and then runs any file under the test directory whose filename ends in _test.rb. Finally we set this to be the default task so that it will run if we just run rake without any arguments. As our test suite gets larger we could make this logic more complex and add new tasks that only run, say, the model tasks, but for our simple application this will work perfectly well. Running rake now will run our test just like the ruby command did before. So now we now how to create model tests and run them easily. When we have model tests we usually have data for test models and by default in Rails this is done by using fixtures. Fixtures aren’t as popular as they once were and it’s more common now to use factories to generate model classes by using gems such as FactoryGirl or MiniSkirt. We won’t be using fixtures here, but if you do want to use them they’re easy enough to add and you can see a good example in this gist. We mentioned earlier that minitest test can be written in either Test::Unit or RSpec styles. In order to demonstrate them both we’ll convert our existing test to the RSpec style. We can use describe blocks in minitest and also it blocks, just like we would in RSpec. RSpec style assertions are a little different. To test for equality we can all a must_equal method on any object and then pass a value to do an assertion. When we run rake now our Rspec-style test should pass just like the old one did. The must_equal method that we used to do the assertion is one of the many methods that minitest provides for assertions. To see what else you can use take a look at the documentation. There’s even a negative variation of each assertion that begins with wont_. Now that we have model testing sorted out let’s move on to integration testing. This can be considered the most important kind of testing in a Rails application as it’s the only type which tests the entire stack. Capybara is a popular way to do integration testing in Rails applications so we’ll use it here. As with minitest we’ll need to add its gem to the test group and run bundle to install it. We’ll create our integration tests in an integration subdirectory, though as before, you’re free to structure your tests in any way you like. 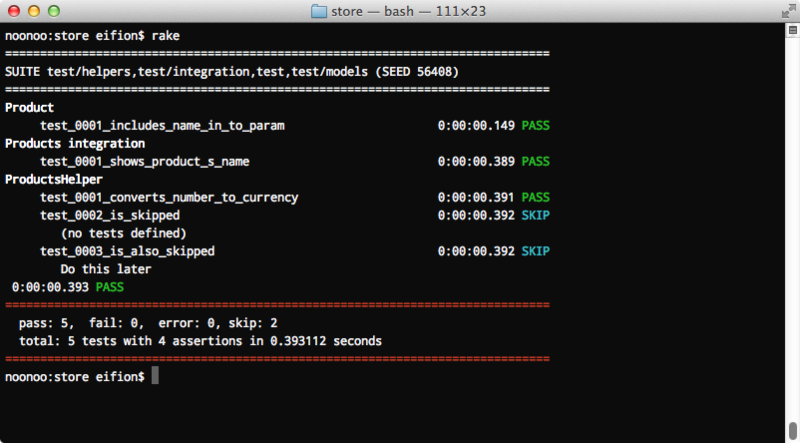 This integration test is structured very similarly to the model test we wrote earlier. This time we create a new Product, visit its page and check that its name is shown. If we try to run this test it won’t work. Minitest doesn’t know about any of our app’s special methods such as product_path or about any Capybara methods. We need to add some functionality to the integration tests for this to work and we’ll do this inside our minitest_helper file. We’ll create a new class in this file specifically for integration testing. We do this by having the class inherit from MiniTest::Spec. To get URL helpers working we include Rails.application.routes.url_helpers. For Capybara we have to require capybara/rails at the top of the file and then include Capybara::DSL in the class. To tell minitest to use this class for integration tests we use the class method register_spec_type. This takes a regular expression which is used to match the name passed to the describe blocks in out tests. We’ll match anything that ends in integration. We also need to pass in the class to use and we use self here so that this class is used for all integration tests. Now any test whose description ends with “integration” will pick up the behaviour of the IntegrationTest class. When we run our tests now they both pass. Finished tests in 0.485831s, 4.1167 tests/s, 6.1750 assertions/s. The integration test passes despite us not making any changes to the controller or views as the scaffolding code already has the behaviour that we’ve tested. Now that we know how to do integration testing lets take a look at testing some of the other layers. We wouldn’t normally test views and controllers directly as we have integration tests and we can move any complex controller logic off into a model. Separate helper tests are still useful, however. We don’t have any methods in our ProductsHelper to test so instead we’ll test one of Rails’ built-in helper methods. These tests look similar again to model and integration tests. This test will throw an error because our simple minitest doesn’t know about the number_to_currency helper method. We’ll have to add this behaviour to it and to do so we do something similar to what we did to get integration tests working. We’ve created a HelperTest class similar to the IntegrationTest class we created earlier and like that class this one includes a couple of modules and then uses register_spec_type to define the tests that should use this extra behaviour. Any test whose describe block’s description ends with Helper will use this class. Note that as the ActiveSupport::Testing::SetupAndTeardown module isn’t included in Rails by default we’ve had to require it manually. When we run our tests now they all pass again as the helper test has access to Rails’ helper methods. There are several features that minitest provides which we haven’t covered yet so we’ll show a few of them now. We can mark a test as skipped in a couple of different ways. One way is to remove the block so that we just have the call to it. The other is to call skip inside the test definition. When we run the tests now two of them will be shown as skipped. Finished tests in 0.688833s, 4.3552 tests/s, 5.8069 assertions/s. This will run the tests using that seed so that they’re run in the same order again. We’ll finish this episode by showing how the tests’ output can be improved by using the Turn gem. This isn’t strictly related to minitest but it works well with it. To use it we’ll need to add it to the gemfile and then run bundle again. When we run the tests now the output is quite a bit different. By default the output is more verbose and shows more detail about each test and its status. It we look at Turn’s README we’ll see that there are many different configuration options that we can use to customize the way the output looks. We can customize turn in our minitest_helper file by adding this line at the bottom. When we run the tests again the output looks quite different. If you don’t like this option there are a number of others from which you can choose. That’s it for our look at minitest with Rails. Hopefully it will have given you some idea on how you can customize minitest to fit the way you test your Rails applications. To see another approach take a look at the minitest-rails gem. This includes some generators for setting up minitest in your Rails apps and its source code is straightforward so it’s worth reading through to see how else you can set up minitest. Finalyl we’ll mention one other gem, capybara_minitest_spec. This includes some methods that we can use in integration tests with Capybara that work very similarly to what we’d do with RSpec. If you’re missing the matchers you get with RSpec take a look as this gem.